Diary of a mothering worker. July 12, 2017. If you are thinking that corporate leaders have a role to play in ensuring a better future than the present, now is the time to make that difference. A key concept underscoring your effort should be economic justice. That is your real bottom line. The first hit for economic justice defines it as “a set of moral principles for building economic institutions, the ultimate goal of which is to create an opportunity for each person to create a sufficient material foundation upon which to have a dignified, productive, and creative life beyond economics”. There are important ideas here: ethical economic arrangements, fair access to opportunity, and a fulfilling life beyond work. It’s good to ask whether these exist here, particularly in our most vulnerable communities and in the lives of a new generation whose futures are being shaped by today’s realities. As Lloyd Best said to me, all you have to do is walk around with your eyes open. Start by actually walking around. Observe the inadequacy of public transportation, the justice system, prisons, government schools, public hospitals, pavements, conservation, waste management and agriculture. Observe the level of trust in institutions and the feeling of safety in communities. Understand these are problems of law and policy implementation, of state financial accountability and sufficiently funded social services. In other words, problems which cannot not be fixed by charity. Ask yourself, where are the public places people can go to be inspired to find their higher selves, and to experience beauty? And, before you think these are luxuries, ask yourself how brutish you might have become without exposure to such places. Some of life is about hard work, but some is also about rights, freedoms and fairness. Some is also about necessary green spaces even amidst urban spread just as much some is about empowering schooling. Get a map, go community by community, and check off a scorecard, asking yourself how neighbourhoods with such pervasive domestic violence and child sexual abuse reporting rates could produce anything other than the social violence we are experiencing today. Correlate that with current unemployment and under-employment statistics and assess what is worsening in those households, and likely to affect all of us someday. How will you put your shadow power, meaning your unequal capacity to lobby and determine agendas, decisions and decision-makers, to work to transform these debilitating contexts? In 2012, Fortune Global 500 companies made an 820 billion US dollar profit, but in 2013 only spent 20 billion of that on corporate social responsibility. Do the math for T and T. Take your map and your math to your meeting when you discuss, in these dire times, what serious corporate social responsibility must now mean. Historically, Caribbean economies have produced great wealth, whether from cocoa, sugar or fossil exploitation, all the while reproducing impoverished conditions in people’s daily lives. The book Why Nations Fail has a basic premise of relevance here. Places with extractive economic and political institutions, which work to make the wealthy and powerful more wealthy and powerful, will eventually implode. This brings down the whole society, economy and population; destroys flourishing creative possibilities, technology and innovation; and sees new actors, like cartels and gangs, competing for control. The solution is to create a nation with stable central authority, such as a functioning state, but with pluralist or widely inclusive decision-making; the best chances for everyone to thrive economically amidst safety and stability; and outright challenge to the iron law of oligarchy. This is tough for local elites as import-based businesses and the iron law of oligarchy, known locally as contacts, corruption, sweet deal contracts and party financing, are how many do well despite everyone else’s falling ability to make ends meet. It comes back to supporting civil society advocacy on everything from the ratification of ILO Convention 189, on decent work for those domestic workers in your homes, to immediate roll out of a national recycling programme, to approval of a national action plan to end gender-based and sexual violence, to refusal to opt for greater securitization – weapons and surveillance systems – over economic justice with institutional and social inclusion. CEOs, it’s time to put your power to make these happen. Diary of a mothering worker. July 5, 2017. Wednesday afternoon found me playing a game. Every two years, the Institute for Gender and Development Studies at Cave Hill hosts a summer Institute in Gender and Development. This is their twelfth session, and participants from Dominica, Jamaica, Bahamas, St. Lucia, Barbados, Belize, St. Vincent and the Grenadines, Cuba, Guyana, Antigua and Grenada were there. More than two dozen people of all ages, ethnicities and sexualities in one of those special opportunities to come together as Caribbean people. I’ve been playing this game for twelve years. Called ‘Steppin Up’, it’s a feminist-movement building game focused on consciousness-raising, strategy-sharing and solidarity-building. The board is the size of the room, made with masking tape. Each square offers scenarios in which groups must choose options, sometimes thus moving forward or back, and understanding more about the complexities of addressing issues from child sexual abuse, fair trade and youth leadership to working across religious boundaries. Regardless of your organization or issue, the Caribbean terrain is beset by all these challenges. The goal is to provide players with an experience they can reflect on, for plenty people, especially with activist commitments and aspirations, talk good politics without reflecting on how they actually engage others, make decisions, and assess their movement’s strategic gains and losses. Someone always starts off asking how to win. After playing, I ask them for the answer. They realise it’s not a race and that frame prevents them from creating collaborations or working across divides when possible. Also, what’s gained if you rush ahead to complete the content, but miss the group dynamics that mean people feel silenced, trivialized or disrespected along the way? I set no rules and, later, players realise how many they conservatively set themselves. Nothing stops them from challenging everything they have been taught about competition, and how much it alienates us from each other and ourselves. Yet, they rarely make the radical decision to collaborate across groups although that could transform their entire experience of the game. Players reproduce competition, hierarchy, and goal-oriented rather than people-oriented decision-making because of Caribbean schooling, which continues to work for some individuals, but not for the region. We just don’t provide enough lessons of collaboration, attention to emotion within and across our collectivities, rewards for rethinking alienating rules, and strategies for enabling all, rather than just those who come first, to ‘win’. That deficit shows up in our capacity to ultimately create equity, justice and social inclusion. Many spoke about the joy of a methodology that prioritized participation, decision-making, group-learning, activity, self-reflection and fun. It’s unsettling to think about how much less they would have learned had I opted for readings plus a chalk and talk approach. Draw down from this lesson to our children whose age makes learning through activity, self-reflection, challenge and collaboration the most appropriate model. Add those children who are especially least likely to get the most from desk-bound, chalk and talk approaches, whether in relation to math or creative writing. Think of how many up and coming Caribbean young people we set up to fall two steps back. I see the risks for Ziya too. She’s not yet clicked into desk work and becomes dreamier in the face of stressful schooling, though she loves learning through activities, discussions, play and books. At home, I get my news from reading, Stone gets his from TV. As it is, he knows much more than I do from the volume of news and commentaries he watches. Imagine if it was newspapers or nothing. That’s our schools. We enforce one way of teaching and testing, rather than the necessity of multiple routes. Imagine even students who ace high stakes assessments may end up in their third choice of school and feel like failures because of a slew of layered hierarchies and inequalities. Surely, this result says more about our inadequacies than our children, about our commitment to the exam over equity, justice and social inclusion. 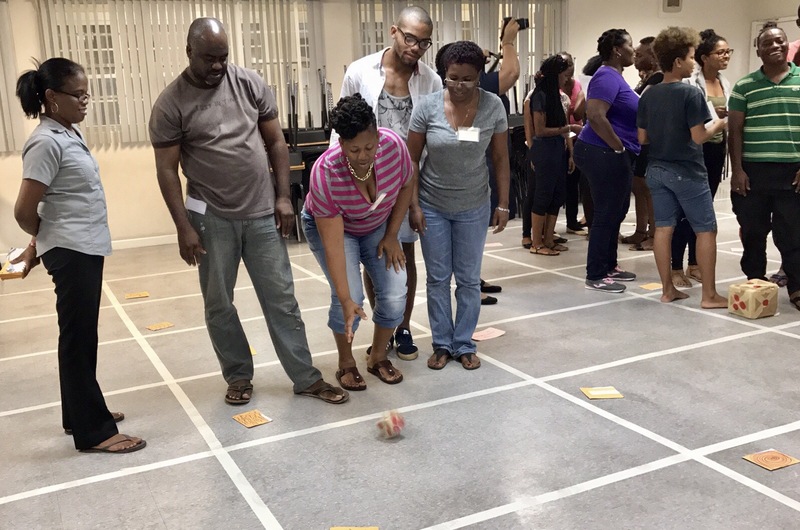 When a region of adults still wishes to learn through methods, including games, that validate how well-rounded, socially-conscious Caribbean people grow, we should step up and account for the real politics of our pedagogy, what works and should stay, and what fails and must go. Diary of a mothering worker. June 22, 2017. It’s hilarious and so typical. These last years, Ziya was vehemently into pink. Every opportunity to get dressed was declarative. In contrast to my choices, she would insist on locating pink pants, pink tops and pink hairclips, proclaiming that it was her body so she should decide. As I stood in front of the cupboard doors, blue pants and yellow tops dangling ineffectually from my arms, you know which feminist mom was seriously contemplating the pros and cons of teaching empowerment to a contrary four year old. Avoiding absolute fundamentalism, pink could be matched with purple in her lexicon of outfit possibilities, and Zi would initiate repetitive conversations about which colours were our favorites – mine is green, and hers pink and purple. Such verification was intended solely to confirm which colours she consented to, which she thought went well with pink, and which coordinated with various media influences, such as Doc McStuffins or Lego Friends. My friends laughed at the irony of Ziya’s steadfast commitment to such gender stereotypical representation, for I eventually gave in to my inability to change the mind of a four year old despite the fact that I was pursuing all kinds of efforts to change the public’s mind about the normality of a sexist status quo. I threw up my hands because I recognised that she was unlikely to escape the dominance of precisely those ideas. Understandably, she was also working out how to fit in with her peers and social norms. Plus, all parents know when and how to choose their battles with children, who will negotiate with the bloody-mindedness of a terrorist or a gladiator to get what they want. Lo and behold, and out of the blue, she is now done with pink. But, of course, guess which colour is suddenly her favorite? Whole new conversations must be initiated in contexts with no apparent relevance, and old positions must be explicitly revised, to make the point about these new terms of level cool. Now we are pulling my black shalwar dupattas from the cupboard to joyously create black robes like, of all characters, Voldemort. Dolls are being marker-made up with black ‘lipstick’. Apparently, we must go looking for black flowers. Black starry pajamas are being donned after afternoon baths. Black and red tutus are being fashioned, and worn over self-same pajamas, all entirely explained by the trending status of black. Dizzied by this unpredicted turn of events, all I could do is sit in front of the cupboard and dreamily wish for a minty mohito. It’s humbling to know that, however capable you consider yourself in the public world of work, you will hardly be able to keep up with a six year old’s changes of mind and personality. The change is surprising as the hearts and glitter girl power of Sophia Grace and other Disney children stars still provide the soundtrack for Zi’s home-based “dance shows”. Maybe it came from playing new characters, like zombies, with her neighbhourhood friend, whose interests are also changing. Or, because we finished the first three Harry Potter audio books over Santa Cruz’s morning traffic, and she’s intrigued by the beckoning power of dark forces and Hogwarts uniforms. Maybe she’s decided to identify with my sister, who herself had a long Goth phase, and who Ziya associates with snakes, bats and dangerous wildlife. Our children have multifaceted psychological shifts in their little lives as part of their growth. For parents surviving storms, and the stress of school tests, it’s a good reminder that they also excel in evoking so much laughter and love.